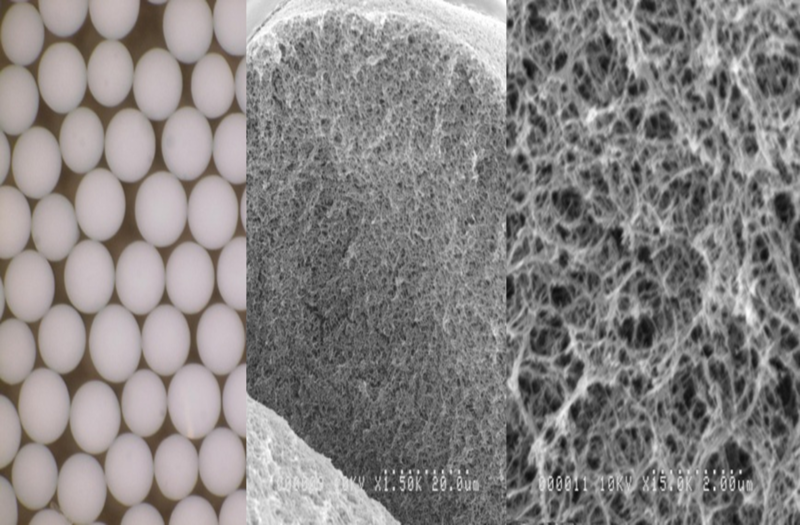 The Cellufine™ chromatography media is based on spherical cellulose beads, which exhibit high chemical stability, high mechanical strength, and inherent bio-compatibility. Cellufine™ chromatography products are appropriate for all chromatographic techniques. Gel Filtration, Ion Exchange, Affinity, and Hydrophobic Interaction chromatography media are available for preparation of a broad range of target molecules. For purification of bio-molecules and proteins by molecular size. Cellufine™ MAX IEX series media demonstrate higher DBC compared to other agarose or acrylic media, even under high flow rate conditions. Cellufine™ MAX IEX chromatography media perform effectively under high pressure conditions, enabling efficient purification of biopharmaceuticals. Cellufine™ MAX IEX chromatography media are optimized for high adsorption and resolution. Figures below show the separation of model proteins. Good separation profiles are observed. Cellufine™ MAX IEX chromatography media maintain high binding capacity over a range of salt concentrations. This characteristic enables the omission of buffer exchange steps prior to the use of Cellufine™ chromatography media. The binding capacity of ion exchange chromatography media depends on ionic strength and pH. Separation conditions need to be optimized depending on the characteristics of the target proteins. Figures below shows that Cellufine™ MAX S-h media has a higher IgG binding capacity than Agarose S type media with 10 mM NaCl at all pH levels tested. Even with 100 mM NaCl, Cellufine™ MAX S-h media demonstrates higher IgG DBC at pH 4.3. Aggregate formation is a common issue during monoclonal antibody (mAb) manufacturing processes, including cultivation, Protein A column elution, low-pH viral inactivation, and ultrafiltration/diafiltration. These mAb aggregates can decrease pharmacological activity and induce overactive immune responses such as anaphylactic shock, and thus need to be removed. Cellufine™ MAX GS is a strong cation exchanger designed to remove mAb aggregates. The Cellufine™ MAX GS matrix comprises highly cross-linked cellulose. Surface modification with graft chains containing ion-exchange groups creates a specialized structure that offers a unique mechanism for separating antibody monomers and aggregates. Pore diameters are also optimized to deliver high adsorption capacity. Cellufine™ MAX GS provides a valuable tool for tackling aggregate removal. ▶Graft modified Cellufine™ MAX GS showed to be less susceptible to pH condition in comparison with dextran modified Cellufine™ MAX S-h. Distinct MAb monomer and dimer peaks are obtained with gradient elution. Cellufine™ Sulfate chromatography media is an affinity media for the concentration, purification and depyrogenation of virus, viral/microbial antigens and heparin-binding proteins. Unlike heparin chromatography, the ligand of Cellufine™ Sulfate media does not have an animal origin, and safety concerns are minimized. Similar to conventional heparin chromatography, Cellufine™ Sulfate media can be used for purification of various types of viruses. In the case of the influenza virus (H7N7) purification study shown below, high degrees of concentration and yield are achieved, while proteins and DNA are effectively removed. As Cellufine™ Sulfate media, unlike heparin chromatography, does not use animal-derived ligands safety concerns are minimized. 1. HA-titer: Virus titer was estimated by hemagglutination assay. 2. A280 readings during parts of the load and wash stages of the run exceeded the detection limit and are shown as a dashed line. Cellufine™ Sulfate media is more stable in acid and alkali conditions than is heparin agarose chromatography media. The graph on the right shows that Cellufine™ Sulfate media maintains its adsorption capacity of lysozyme over 40 days even with the use of 0.2 M HCl or 0.5 M NaOH, while heparin agarose media shows a sharp drop in adsorption capacity with the use of 0.01 M HCl or 0.5 M NaOH. Cellufine™ Sulfate media can be operated under high flow rate conditions. The graph on the right shows that the flow rate of Cellufine™ Sulfate media is linear up to about 250 cm/h. Even under high pressure operation, compression of the bed height is less than 15%. This data was obtained from a study using three different lots of Cellufine™ Sulfate media. 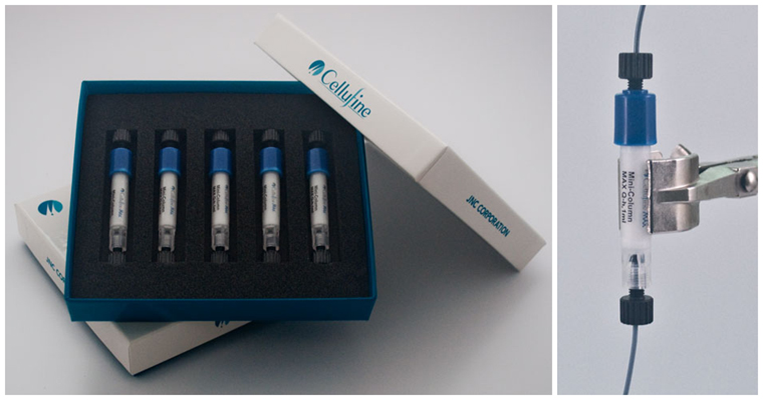 The Cellufine™ ET clean is poly(ε-lysine) immobilized Cellufine™ (cellulose spherical beads). The beads bind and remove endotoxin from your sample solution. The poly(ε-lysine) is a microbial poly (amino acid) that consist of 30-35 lysine residues produced by Streptomyces albulus. The poly(ε-lysine) ligand and cellulose beads are products of JNC Corporation. The adsorption of endotoxin was measured as follows: The beads were washed and equilibrated with 0.02 M phosphate buffer (pH 7.0) – 0.05 M NaCl. The removal of endotoxin was determined using a batchwise method with 0.3 mL of wet beads and 2 mL of a protein solution (1 mg/mL) containing natural endotoxin. The suspension was shaken for 2 hr at 25 ℃. The endotoxin content was measured after filtrating through a 0.8 μm cellulose acetate filter to remove the beads from the suspension. •ET clean-L is compatible with high MWt. proteins due to its large pore size. •Scale able into columns up to 30 cm in diameter. 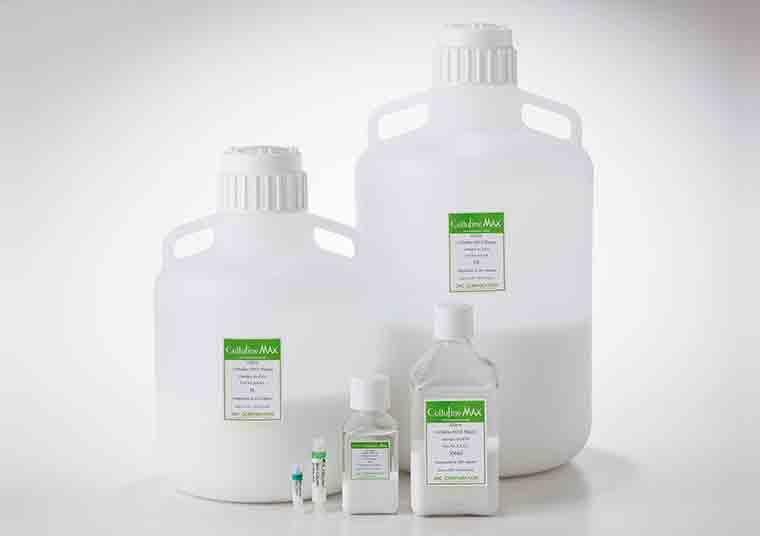 Cellufine™ Chelate media is designed for use in immobilized metal chelate affinity chromatography of proteins and peptides. The media comprises cross-linked cellulose to which iminodiacetic acid (IDA) is immobilized. Its rigid structure allows operating under high flow rates, which gives rapid processing times. When exposed to metal salts, IDA readily complexes with the cation. The resulting metal chelate moiety interacts (primarily) with the surface accessible residues, such as histidine tag. 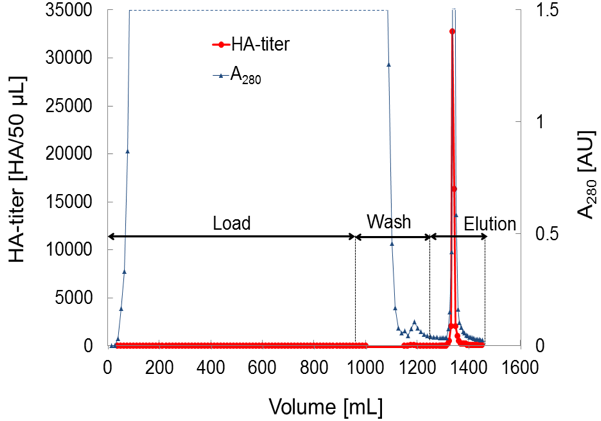 Gel Filtration, or size exclusion chromatography, has proven to be a simple and effective purification method for proteins and other biomolecules. However, the traditionally slow flow rates and limiting resolving power of most gel filtration media have restricted its usefulness. These problems, inherent to the packings, existed not only at the laboratory preparative scale but especially at process scale. The limited throughput of gel filtration columns has often created a significant process bottleneck. Cellufine™ GCL media overcome these limitations. The mechanical strength of the spherical cellulose matrix allows high flow rates, even in large industrial columns. This media offer an extraordinarily broad selection of fractionation ranges: from the unique Cellufine™ GCL-2000 and Cellufine™ GCL-2000HF for very high molecular weight protein complexes. The following table shows the exclusion limit for the media. Cellufine™ GH-25 desalting media is based on porous, spherical, highly crosslinked cellulose particles. The sharp 3kD exclusion limit allows proteins to pass through the column in the void volume while retarding smaller molecular weight solutes in the internal pores. Outstanding mechanical strength allows operation at high flow rates even in large diameter process scale columns, thus minimizing run times. Although the rigidity of Cellufine™ GH-25 makes it ideally suited to large scale column use, its ability to operate at very high flow rates enables the use of smaller columns running multiple cycles giving similar throughput to lower flow rates on larger columns. Unlike conventional chromatography, the performance (as measured by sample load, salt removal, and dilution) of desalting chromatography can actually improve as the flow rate increases, due to decreased sample dilution at high volumetric loads.